For 45 years, the Freight has hosted some of the finest musicians from around the world and the Bay Area. Tonight we’re proud to present “Generations”, featuring a lineup that reflects both the cultural diversity within traditional music, and the generations of family members that have made their mark at the Freight. Guitarist Mike Wollenberg has released two solo albums and recorded with Darol Anger, Mike Marshall, and Dave Balakrishnan. His daughter Leah has performed at the Savannah Music Festival and the Montreux Jazz Festival. She teaches fiddle and studeis jazz at Oberlin College. Father and daughter Alan and Aya Davidson play in the band Agapi Mou, which is Greek for “My Love”, and signifies the band’s love for traditional Greek music. Aya sings and plays violin, and Alan plays lute. 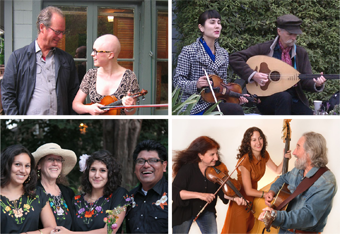 Eric and Suzy Thompson have been playing for years as a duo and as part of a wealth of wonderful bands, including the Any Old Time String Band, Klezmorim, and the California Cajun Orchestra. Their daughter Allegra has played with the Drifter Sisters, as well as with Gene Tenney and Alan Senauke. La Familia Peña-Govea play traditional Tex-Mex and Colombian rancheras, polkas, valses, vallenatos, and boleros. Miguel Govea and Susan Peña are both multi-instrumentalists and their daughter René is widely acclaimed for her button accordion playing and singing.